The Oakland Museum Women's Board presents the 60th annual White Elephant Sale, Northern California’s biggest and best rummage sale, which takes place over one grand weekend with free admission for all. 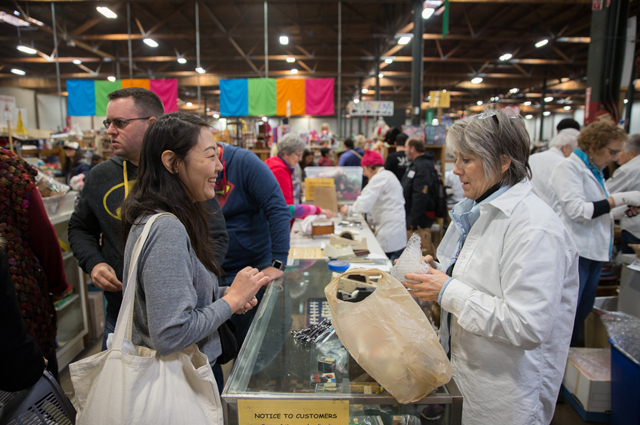 Held in a 96,000-square-foot warehouse at 333 Lancaster Street, near the Oakland Estuary, the sale offers something for everyone, with clothing, jewelry, books, tools, art, sports equipment, furniture, household items and more. All sale proceeds benefit the Oakland Museum of California. Free admission and free shuttle to and from the Fruitvale BART Station. Please note that parking is extremely limited in the area. Interested in donating to the White Elephant Sale? View public donation drop-off dates and learn more at WhiteElephantSale.org.